Who needs website proofreading services? Website proofreading is become more and more important as the competition on the Internet increases. How would you feel if you bought a book or a magazine which had grammar, punctuation or spelling errors? Or, even a product with a badly written User Manual making it impossible to understand? Wouldn't you think it was unprofessional? Good for a first check. BUT... They are only programmed to pick up a limited number of rules and you anyway need a basic knowledge of grammar to know what to change. Yes, definitely use them - you will pick up a lot of errors this way. BUT... A spellchecker cannot identify if the use of the word is incorrect so long as it is a "real" word. For example, confusing it's and its is a common error which a spellchecker won't pick up. Non-native English Speakers: Many words are "false friends" which means they sound similar or have a similar spelling in another language but the meaning is not the same. Good to get a general understanding of the material. BUT... Texts are translated "word for word" and sound very strange to a native speaker. Many idioms which sound perfectly fine in a foreign language do not makes sense when translated. If English is your second language, you MUST get your writing checked over by an editor who is a native English-speaker if you want the result to be professional. Click here to read more. After you've finished writing and have read your work over again, you may want to make changes and adjustments. It's pretty much a given that EVERY time you read your work - there is something to change. The more important the text, the more you will want to read it and change it. Know your audience. If you are writing for an intellectual audience - and this also applies to writing text books, exams or business letters - you need to use formal language. You need to use longer sentences and more sophisticated vocabulary. If you're writing a blog, a newsletter or marketing a product, you usually want to use a more friendly style of writing as if you're talking directly to the reader. 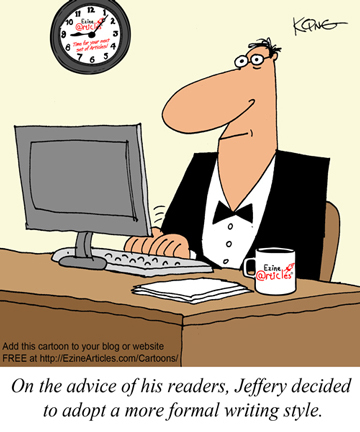 Make it easy to read - use short, concise paragraphs. Avoid using the Passive voice. Each paragraph should deal with a separate thought. Make sure you follow through with your train of thought. Keep to a logical order - don't jump from one subject to another. In British and American English, there are many different words for the same things. Just as an example, a handbag in Britain is called a purse in America and just to make things even more confusing, a purse in Britain is called a wallet in America! And then there are words which mean the same but have different spellings, like travelling and traveling, labour and labor, realise and realize. Either style is fine, but you must stick to one or the other! 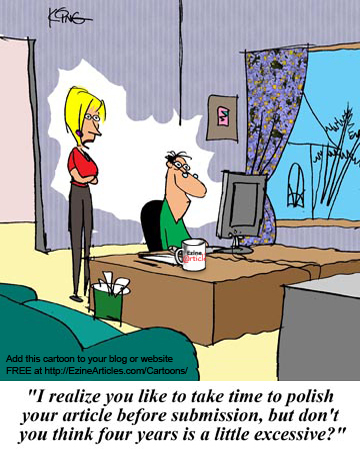 Before you start on proofreading your website, take a break for a day or two then look over your work again and give it a final "polish". It is entirely normal to find a few - or several things you will want to change or adjust. The danger is that you might get fed up with looking at it or you won't be able to see the errors because you've seen them so many times. Or you just may not have the time if you have a deadline to meet. This is why most professional writers work with an Editor. An Editor must have a good knowledge of the language, but the most important thing is that he/she is an objective observer. An Editor is a fresh pair of eyes! An Editor will not only make sure that you have kept to the above rules, but will also look at the style and flow of the text. Whether you're writing a book, an article for a magazine or a website, proofreading is the final stage before publishing your text. The difference between proofreading and editing is ... Proofreading is where the text is checked for grammatical or spelling errors (typos), correct spacing and punctuation. Editing will review the continuity of the thought process, the correct use and context of the words. In addition, editing will ensure ease of reading with a clear understanding of what is written. Again, it's preferable to get a professional to do this for you. Even if you think you've done a good job at self-editing, I would recommend that you still use a website proofreading service. You will find Proofreading and Editing services cost effective and well worth the investment. There are many proofreading and editing services on the internet. But editing texts written by non-native English speakers will need special skills. There is a need for Professional Website Proofreading and Editing services. Although knowledge and passion for your subject is important, if your website is full of grammatical errors and wrongly used idioms you will never come up in the search engines, you're visitors will move on very quickly; and will probably not return!